Then along came the long winter, dragging on for six months, blanketed each square foot of the land in deep snow, confining inhabitants in the warmth of their own homes. Instead of remaining idle, cursing the frigid winds blown from the Alps, a few of these farmers, knowing how adept they were with their hands, found a noble way to pass the time in a fruitful manner. They began to assemble watches in their workshops which had been set up on the top floors of their homes, penning the early chapters of a cottage industry which would eventually flourish to dominate the world. Last September, Jean-Claude Biver, a legendary watch manager, announced his relinquishment from operational duties. He stepped down as executive president of the LVMH watchmaking division, overseeing Hublot, TAG Heuer and Zenith, to become non-executive president. Although it was an expeditious decision, it was not made lightly as he chose “to listen to my body”, which he attributes the action to him being “wiser”. “I would never have decided to retire if I haven’t been ill. Because of my health problem, which is serious, I decided that I should also care for my body and not only my job,” he says without disclosing his illness. With a laugh, he affirms that “the body has taken over as the boss” and the roles have been reversed. Now he intends to devote more time to his family and of course – his cheese – famous among his inner circle and those who have been supportive of Hublot, clients and dealers included. His farm produces five tonnes of cheese annually, of which not a single ounce is available for retail purposes. “When I discovered watchmaking in 1974, the watchmakers brought me to their farms where they made cheese. I exclaimed ’you make cheese’. They said ‘Yes, before we make watches, we only make cheese. We were all farmers. When the French came in the 18th century, they taught us watchmaking. But before that, we were all making cheese. In our farms, my grandparents had nine kids. “One of the children started to make watches during winter. Then he became so successful that he made watches not just during winters but also summers. Gradually, his brothers also began making watches. In the end, there was only one son who continued farming’,” Biver regales the origins of Swiss watchmaking, citing that the inspiring episode ignited his ambition to also one day dabble in cheesemaking to complete “the whole circle”. He sees plenty of parallels between watchmaking and cheesemaking, in that both are quintessential to the Swiss identity. They both require innovation, cleanliness, control, precision, patience and passion. Born in Luxembourg in 1949, Biver uprooted to Switzerland for schooling at the age of 10. That sown the seeds for an eventual decades-long liaison with horology. 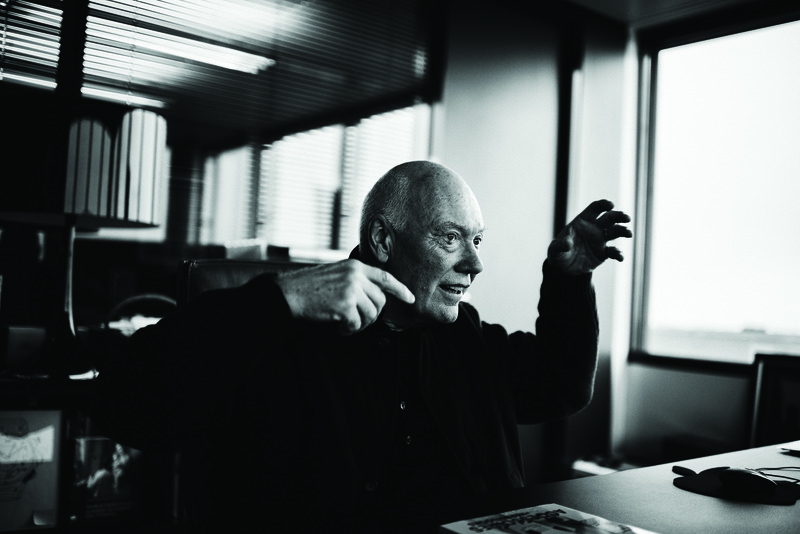 Prior to joining Hublot, Biver had already garnered a reputation for being a managerial genius with a knack for turning around watch brands that had rich history but were limping along besieged by nimbler, younger competitors. In 1981, he purchased Blancpain, which had gone bust in the ‘70s thanks to the quartz crisis, for a modest outlay of CHF22,000 along with Jacques Piguet, a long-time friend. Blancpain, founded in 1735, is one of the oldest names in the Swiss watchmaking industry and boasts the rare expertise of producing grand complications. He revitalised the brand by tapping into its wealth of heritage and highlighting the artisanal value of mechanical movements as a mark of defiance to the mass-manufactured quartz movements. His slogan? Since 1735 there has never been a quartz Blancpain, and there never will be. Nearly 20 years later, he sold Blancpain to the precursor of the Swatch Group for CHF60 million where he stayed on as director in the group. At the same time, he also took Omega under his wing. Making a sweeping revamp of the brand’s marketing strategy, the move propelled Omega to capture more eye balls through product placements, celebrity endorsements. It was under his reign that James Bond, then portrayed by Pierce Brosnan, ditched Rolex for a Seamaster, beginning with GoldenEye. Nonetheless, Biver’s quest to achieve greatness would arrive in 2004 when he joined Hublot after cutting short what was supposed to be a sabbatical. The original Hublot watch, released in 1980, resembled the porthole of a vessel. The word ‘hublot’, which has the same meaning, was borrowed from French. Aesthetically, it contains a dozen of tiny screws on its bezel. While it proved to be a hit among collectors as it burst onto the scene, gradually, the brand stagnated. By early 2000s, its popularity had waned and in dire need of renaissance. Another challenge was to create a message for the brand because products alone would not be sufficient to stand out among an ocean of alternatives. Hublot is a relatively young name in this sphere of centuries-old craft and was founded in 1980 on the premise of innovation. It broke the mould of what a Swiss watch should be upon inception by utilising rubber straps. The natural material was not thought of befitting a luxury watch, unlike metal bracelets and leather straps, even if it made perfect sense as the material of choice for durability and comfort. “The message was ‘the Art of Fusion’ because to bring rubber and gold together is none other than through fusion. In life, rubber and gold will never meet because gold is under the earth, while rubber is on the tree. What is on the tree cannot meet what is under the earth, except when you bring these two materials together, which is fusion,” he explains, adding Hublot will always be guided by fusion while repeatedly knocking on the wooden table for an acoustic effect to emphasise – a leitmotif to anyone au fait with Biver. When LVMH acquired Hublot in 2008, its annual revenue had swelled from CHF25 million to CHF200 million in the span of four years. The first Big Bang bagged multiple design awards. It also laid the groundwork for further innovation including the manipulation of sapphire crystals as seen in the Big Bang Sapphire and elongation of power reserve as witnessed in the MP-05 LaFerrari. It is often said that success is built upon people. In this case, one of whom is Ricardo Guadalupe, current CEO of the brand and Biver’s protégé and handpicked successor. “I have worked with a lot of people who have grown with me. They have grown to an incredible level like Guadalupe, like Jean-Frederic Dufour who became CEO of Rolex. All these young guys started with me, spent 15, 20 years with me and this is my biggest success – it’s the people,” he says with unflinching conviction when prompted on the legacy that he will be leaving behind. How many watches are there in your collection? I don’t know. I don’t have too many. Maybe about 120, 150 pieces. Any particular style that you gravitate towards? I like chronographs; I like perpetual calendars. Ideally, I would like to have a watch that is both a chronograph and a perpetual calendar. Then I have both in one. But the chronograph is my first love because it is a dynamic watch. It moves and you can stop it. I also like the perpetual calendar because of the moonphase. The moon is nostalgic. I am still amazed that the perpetual calendar was invented before the computer. Which is your favourite Hublot watch? This one (pointing to the Bigger Bang All Black on his wrist which was released to the public in 2007) because I wear it all the time. This watch has brought me a lot of luck, happiness and success. When I wear it, I feel that I am protected.